In London you’re spoiled for choice when it comes to food, which makes it an adventure to try out as many Asian fusion restaurants as possible. One that I stumbled upon was Chino Latino, a Japanese-Peruvian restaurant located in Embankment (in the Park Plaza Hotel, to be precise). As the restaurant is located in a hotel we didn’t expect it to be bursting with colour. The hotel itself was quite vibrant inside, making it difficult to concentrate as you walked up the stairs. But the restaurant itself has a relaxed atmosphere, mostly due to the red lighting and decor. Being a Wednesday night, the restaurant was not busy but the music from the bar definitely set the tone. After being seated with a view of the street (if you’re at the bar you can get a view of the river) we ordered cocktails and a few plates to share. Cocktails were the Secret Geisha (a gin based drink) and Laced With Trace (a bourbon based drink). The Secret Geisha was sweet but enjoyable. The bourbon cocktail was a bit too strong for me (I’m not a bourbon type of girl) but my boyfriend starting enjoying it after a few sips. I thought it could put hair on any chest. Overall, the cocktails were great. For the food, we ordered: wagyu beef taquitos; edamame, amarillo maki roll; duck breast; moqueca camarão; and calamari. Surprisingly, the amarillo maki roll was the first to arrive at the table. Since we were starving, we dug right in (at least I remembered to take a photo). The sushi burst with flavour, due to the freshness of the fish and aji amariilo. I’m not a fan of tuna, of any kind, but I would happily eat more. The edamame was also tasty and well-coated with salt. Many places don’t get this right and you have to dig for the salt at the bottom of the bowl. I wasn’t too much of a fan of the calamari, that was coated in tamarind and served with tomato, red onion, and mint. I found the tamarind overwhelmed the calamari (which was cooked perfectly) and the tomato, red onion, and mint did not add flavour. I did, however, enjoy the crunchiness of the calamari. My favourite dish was the wagyu beef taquitos. The taquitos were crunchy and were oozing with flavour. It definitely had enough spice and the beef was tender. I’d have this dish over and over again. The duck main course consisted of an aji amarillo and marjorama. It was a tasty dish and the duck was tender, but I found it to be a bit too sweet for me. The prawn main course (Moqueca camarão) on the other hand was divine and warmed you up. It was a simple coconut curry but the prawns were firm and plentiful. And the dish had a bit of heat. Throughout the dinner, the service at the restaurant was great. Until we were done with the main dishes. At this point, it became difficult to find any waiters and we waited about 10-15 minutes before a waiter emerged. This was quite frustrating, as we had finished eating and were now just waiting. Once we had paid the bill, we had to look for the host to get my coat. Once at the front of the restaurant/bar, we couldn’t find anyone to assist us. I would like to go back to Chino Latino because of those taquitos and the sushi. The service was also good until we were ready to order dessert/tea and pay the bill. But I think it may be best to go when the restaurant is a little bit more busy and more waiters are available. J’Something, the vocalist of Mi Casa, has moved into food. After spending some time with his own food TV show he’s expanded into a restaurant. Being a fan of Mi Casa, I couldn’t wait for his restaurant, Something’s Cooking by J, to open on the 1 April 2017. I visited the restaurant a week after it had officially opened and was smart enough to make the reservation a few days in advance. When I got to the entrance of the restaurant, I overhead the hostess letting someone know that the restaurant was fully booked. A good sign if you’re J’Something. After letting them know I made a reservation and finding out our table number, we were escorted to a table (that wasn’t the table we were told) that was outside the restaurant and, basically, outside. As it was cold, I went back to the hostess who escorted us to the table to ask if we could have the table that I had booked, which was inside the restaurant. She was a bit hesitant but after mentioning that I had booked in advance and I should get the tabled I booked she took us in to a table that was in the center of the restaurant. Our originally booked table was outside but in the restaurant. So I appreciate the hostess making a plan for our table. And then we found friends and moved over to their table. While we were still sitting outside the restaurant, J’Something popped over to welcome us to the restaurant. That alone made my night and I may have fan-girled a little. Just a little. As we sat down, starters were already on the table as our friends had been at the restaurant for a while. We tried the Korean dunked wings, a secret menu item, the deep fried mac ‘n cheese, and the trio of bao down. I promise you get more than 3 chicken wings. I took the photo after everyone had dived in. The Korean dunked wings were well covered and the sauce was sweet, spicy and a little spicy. The meat was also cooked well. However, friends were saying that they found the wings to burn and not actually be spicy. While I love spicy food, I like my spice to not be too hot, but I enjoyed the wings as they had a bit of bite. Next I tried the deep fried Mac ‘n Cheese that is served with a spicy (spicier than the wings) pronto sauce and a fondue sauce. The mac ‘n cheese was fried perfectly and the pronto sauce added a much needed tastiness to the blandness of the mac ‘n cheese. The fondue sauce also elevated the mac n’ cheese. The dish is a perfect comfort dish but it is a heavy dish and I found it difficult to eat more than a square. 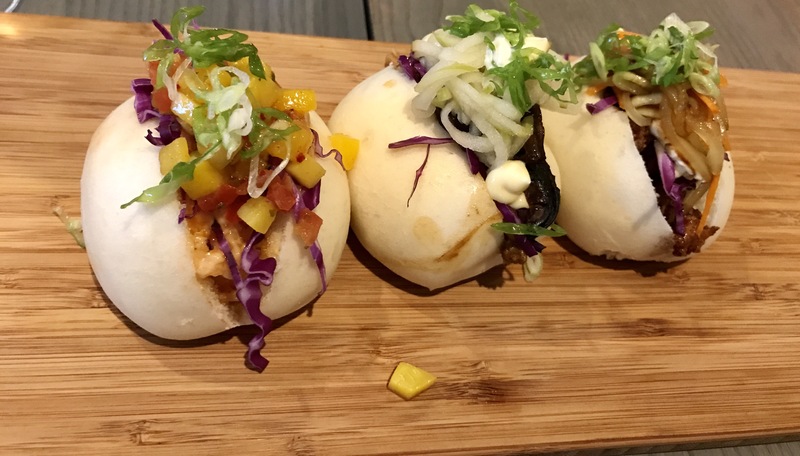 The trio of bao down consisted of chicken, pork and langoustine bao. Overall, the bao was a bit hard and not as tender as bao should be. It also felt like it was store bought. The pork was tender and was served with a cucumber pickle that added flavour to the pulled pork. The langoustine bao with served with a mango and tomato pickle and was also delicious. The pickle cut through the meatiness. However, the chicken bao was not as exciting. I liked the idea of deep frying the chicken but some parts were too hard to eat. The onion pickle and cream cheese didn’t add much to the dish either. For the mains, the 3 dishes I could get my hands onto were the mom’s prawns, pork belly ramen, and the Bra Hugh burger. The mom’s prawns had decent sized, fresh prawns. But that was the best part of the dish. The sauce wasn’t tasty and and the person who ordered the dish didn’t actually finish it. And she’s someone who always orders prawns. I love pork belly ramen so I wasn’t going to miss an opportunity to try it. The ramen broth was delicious and a bit salty. But was the sunny-side up egg, the seaweed with wasabi powder, the noodles, and kale it was delicious. A delicious dish. Until you get to the pork belly. 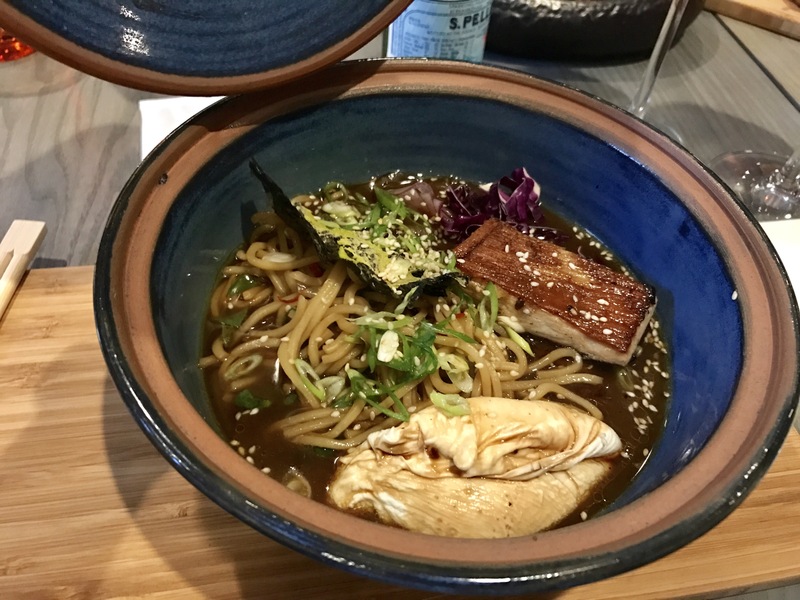 With ramen, the pork belly needs to be tender so that you can break it with your chopsticks (a side note: pork belly should always be tender). For this dish I had to use a knife and fork to cut through the pork. It was not a fun sight. Luckily, with the hot broth, some of the small pieces of became a bit more tender. Also, I didn’t get any of crackling that was in the dish description. The pork belly skin was hard but could hardly be called crackling, it wasn’t that crunchy. Lastly, I got by hands on the Bra Hugh Burger. I had seen reviews about the burger and some weren’t positive. This burger was tasty but nothing special. The beef patty and burger was cooked well and the chutney was tasty. The chips were a bit too soft in the middle for me but a bit crunchy on the outside. I think the chips could have cooked a bit longer. After all that food, I made some space for dessert. And I was the only one who ordered dessert. I think we all filled up on the starters. For dessert I had the Pastel de Nata Cronut, a dish the menu says is a MUST try. The Portuguese custard tart beneath the cronut was divine but a bit too sweet and lemony for me. 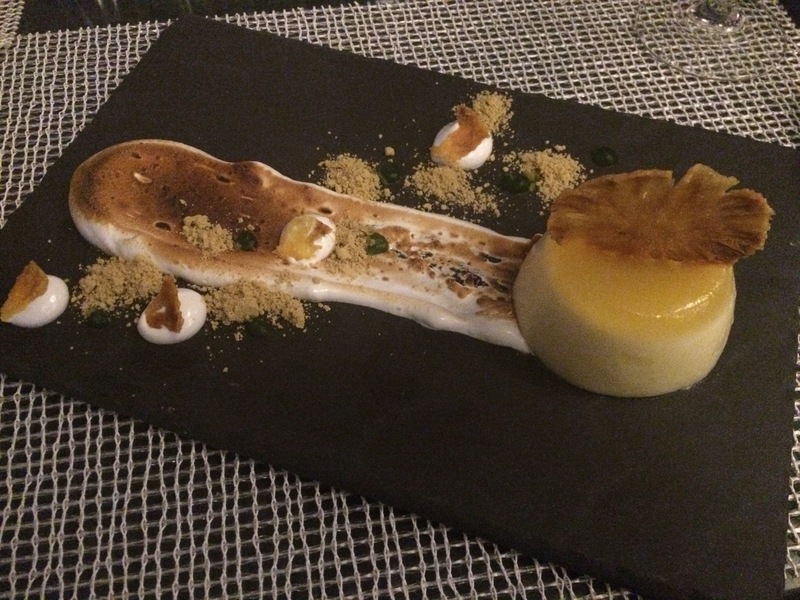 I loved the caramel on the custard tart – it added a slight crunch to the dish. The cronut was soft, sweet, and delicious as well. The two elements worked well together and the coconut marshmallow added some more sweetness to the dish. From a food perspective, there were hit or miss elements on most of the dishes. It seemed like it was difficult to get all the elements to come together for some of the dishes. Therefore, the food is just above average. It’s a great place to grab a hearty meal after or before some gambling or entertainment. And it is, after all, casual dining. In terms of service, the waiters seemed to lack some training. It took a while to order more starters or mains. And the waiter completely forgot to pour me wine as he was going around the table – and we were only a table of 9. The waiter did also look flustered. I did at one point ask him to just to one thing at a time and top up everyone with wine and then come back and take the orders. That seemed to help a little. In addition, the waiters who served us kept dropping cutlery every time they brought a meal to the table. But it was only the first week of opening, so these kinks will get sorted out with time. Also, in terms of service, the delivery of the food was fast. We must have waited, at most, 15 minutes for our main courses. However, the best part of the restaurant and, what makes it a good restaurant, is J’Something himself. This was my first interaction with him but from the moment he greeted me I felt like I was a friend. He was constantly walking around the restaurant greeting patrons that had just sat down and checking up on tables. Even taking time to have conversations and take photos. I didn’t see him turn down a single photo request. He’s attention to his customers was an amazing. It made experience memorable. Lastly, some advice, get a table inside the restaurant. 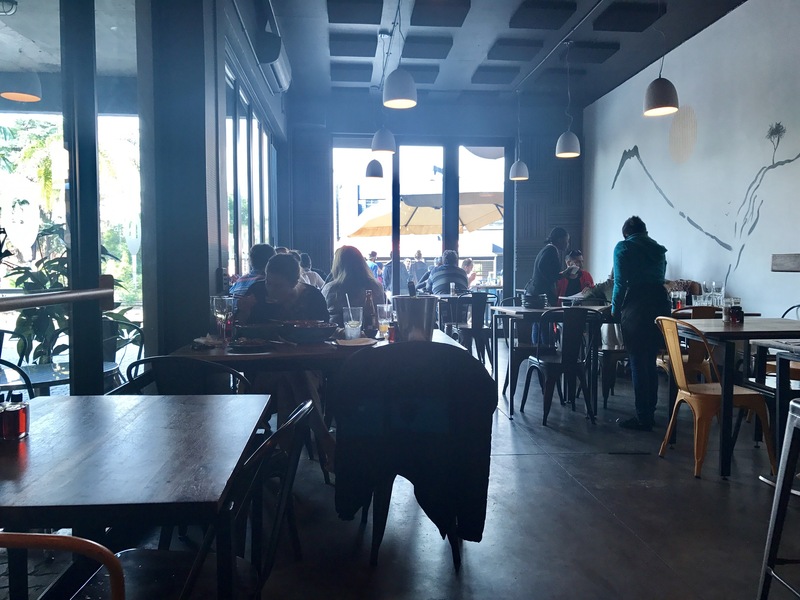 The ambiance is casual, and energetic. It’s like being at a Mi Casa concert. If you’re sitting outside you won’t have the same experience as those sitting inside. Based on my experience and feedback from friends at the table, I give J’Something 3 cupcakes. In South Africa, we’re fortunate to have fantastic fine-dinning restaurants – restaurants that are innovative and keep us enthralled. One such restaurant is the Restaurant Mosaic at The Orient, in Pretoria. From Pretoria it’s about a 30 minute drive and an hour drive from Joburg. But it’s well worth it, especially as you arrive at the gates of the Orient Hotel. The Restaurant Mosaic is run by head chef Chantel Dartnall. And if you’re in the restaurant, eating lunch or dinner, you’re bound to bump into her. My boyfriend and I decided it was best to stay over for the night, than to drive home on dark roads after a few glasses of wine. Better safe than sorry! Upon entering a security guard escorts you to a parking bay. He already knows that you’re a guest of the hotel and not a day visitor. As you walk through the massive front doors, Zele is waiting for you. And you’re immediately taken to your room, where you’re handed a refreshing drink of pomegranate . As it was our anniversary, a bottle of Pol Roger Rose 2004 was waiting for us in the room. Bottle popped and we were well settled in to our gorgeous Udaipur themed room. After a while we got a bit hungry and asked for a light snack. We thought we’d get sandwiches or something similar. But no, Chantel had made a delicious and beautiful salmon salad. It was light, refreshing, crunchy, sweet and has a bit of bitterness. An excellent prelude to the main event. When dinner finally arrived, we made our way to the restaurant and were seated at a cosy booth. It was difficult to notice the people around us, with the way the restaurant was designed. Immediately I noticed champagne glasses. I didn’t order any champagne for dinner as I knew we’d still be feeling the effects of the Pol Roger. But as we were celebrating an important event the Restaurant provided glasses to start off the evening. With our glasses charged a bread cart followed, stocked with a variety of bread. And the waiter insisted that you try more than one. Then Chef Chantel popped by to take you through the menu and different wine pairings and help you decide between the 5 course and 9 course meal. We went with the 9 course menu and the enthusiast wine pairing. How could you not? Still part of a bread, we were presented with a amuse bouche. It was delicious.And an inviting start to the evening. And then the “prelude” continued. First was frogs legs served on a bed of mushroom jelly. I must admit, in all my travels I never ate frogs legs before and I did not prepare myself for it. But as the true foodie I am, I was not going to let the opportunity pass me by. Frogs legs taste like chicken and in this case it was a tasty fried chicken legs. The mushroom jelly added an earthy taste. It was delicious. The frogs legs were served with a Graham Beck Brut (2012) and it paired well. Nothing felt out of place. Once the appetizing prelude concluded, the first course was served: a foie gras mousse in a light muscadel jelly with finely sliced muscat grapes. It was served with truffle brioche. It was gorgeous. The foie gras was rich and creamy, the grapes added freshness and the brioche added an earthy flavor. It was, without a doubt, the best foie gras dish I’ve had in the country. And it was paired with my favourite South African Gewurztraminer: the Paul Cluver 2014. The pairing was perfect as the wine added a freshness to the earthy dish. The second course was the Celebration on Spring. A well-thought out garden salad. It was fresh and light. Everything you would want from a vegetable salad and although it looked beautiful, the flavours complimented each other well. And so did the Alvi’s Drift Albertus Viljoen Chenin Blanc (2012), that was fruity and creamy. I got excited and forgot to take a photo when the dish arrived. The third course was Genesis. Genesis was rainbow trout with a miso mousse and Pomelo. This dish was also tasty and had a subtle fish flavour. The miso had flavour and spiciness. And the Pomelo really did pop. Genesis was a beautifully designed dish but the only problem was that it was paired with the Iona Chardonnay (2014). The wine was still young and clashed with the spiciness of the miso. The fourth course was the course I’ve seen everyone love: Mousse de Mer. And understandable so. The langoustine was cooked perfectly and the tomato froth was light and fluffy and infused with rooibos. And hidden beneath was delicious risotto which added meatiness to the dish. The seashell mousse had an intense tomato flavour. The tomato salt (the sand) added more intense tomato flavoring, so it was best to have as little as possible of this. The dish also contained seaweed which added more salty flavour sauce. Overall, it was an amazingly well-thought out and prepared dish. The flavours complimented the langoustine well and is a dish that has plenty of depth. It paired well with Hartenberg Weisser Riesling (2008), which was slightly acidic and very fruity. 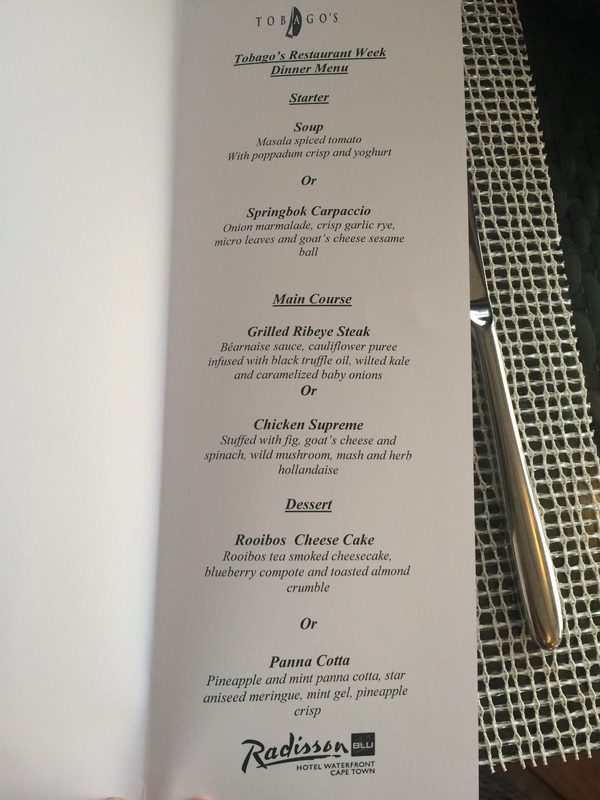 The fifth course was, honestly, the course that caught my attention: Millionaire Nest Egg. A quail egg with black truffle paste, on a bed of truffle infused mushrooms. It was a gorgeous, subtle dish that was earthy and the yolk pierced through adding some sunshine. The earthy dish was paired with the Lismore Viognier 2011 (another favourite) that provided an acidity and freshness to the dish was the hints of peaches and apricots. Finally the starters were done and a palate cleanser was brought to the table: The Garden Pea. The palate cleanser consisted of a matcha and lime with a pea puree. It was a refreshing palate cleanser and fitted in well with the menu. And the peas were from the garden, adding to the ambiance of the hotel. And with that we were halfway, although quite stuffed, and onto the main course. For mains, we had the option of 3 courses: Bouillabaisse (Kabeljou), Prints in the Paddock (Beef), and Birds of a feather (Quail). I love quail, so there was no way that I was going to say no to the Birds of a feather. The dish consisted of King Quail that was glazed with raw honey and Balsamic vinegar. Top that off with saffron scented petite tortellini that is stuffed with slow braised Goose and Capon meat and you’ve got a mouth-watering dish. Add to this sweet onions in a red wine sauce. The dish was sweet, slight acidic, and rich. I loved every bite. The birdy (that’s now a word) was paired with the Mont Destin Pasionne (2009). With the heavy dish, the wine added creaminess and further richness. Lee had the Prints in a Paddock for mains, which consisted of a 36 days matured Angus beef with sumac and a red ivory fruit preserve.The red ivory fruit is from the Red Ivory tree that can be found all over the Francolin Conservancy. Another element from the surrounding areas. The beef was perfectly cooked to medium rate, and the fruits added sweetness. The sumac spices added a hint of tartness to balance out the sweetness. This well-designed dish was paired with the Nederburg Petit Verdot (2001), which added richness and a spiciness to the dish. With out stomach’s bursting, we moved onto dessert. First up was a cheese selection that was paired with Quinta de crosta port. 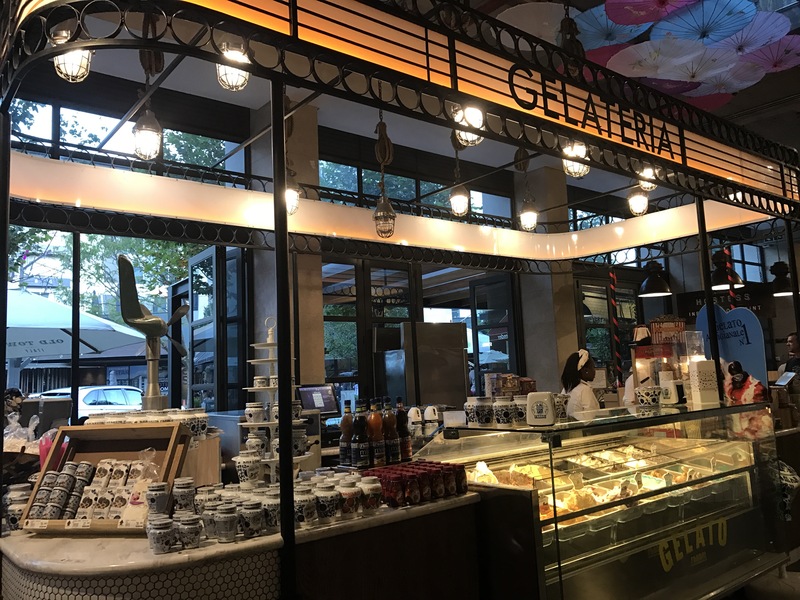 There’s every variety of cheese available but the highlighted choices were the Epoises de Bourgogne, Belnori Phantom Forest, and Dolcelatte Gorgonzola. Most of the cheese paired well with the port, but as I’m not a fan of port of depth and flavours of the port were wasted on me. Next for dessert was the Chocolate Cherry. This dessert had a large cherry filled with chocolate on the plate and was surrounded with cherry infused elements. Again, a fantastic mixture of sweetness, sourness and crunch. And it was delightfully light. The dessert was paired with Chateau Septy Monbazillac (2009), which with its fruity bouquet, complimented the cherry and chocolate. Finally, we were on the Mamelon de Venus. A delicious, light and cruchy choux pastry that was surrounded by Jasmine. It was definitely a Spring dessert: floral and light. And the bright colours of the strawberry and jasmine made it inviting. It was a scrumptious dessert and one that I would travel all the way back to the Restaurant Mosaic for. AND after all that food there was more: Petits Fours. They were too gorgeous to ignore and we may have finished most of it. After stuffing ourselves, we made our way up to our room. A steep affair if you’ve drunk all the wine pairings. Come the Sunday morning and we were still stuffed, but I couldn’t miss an opportunity to see what breakfast would entail. And breakfast was superb. After being seated, a slightly warm herbal, ginger and lemongrass tea was placed in front of you. It was a delicious tea at the right temperature on the warm morning. A pastry tier was also placed on the table. Herbal tea with ginger and lemongrass. 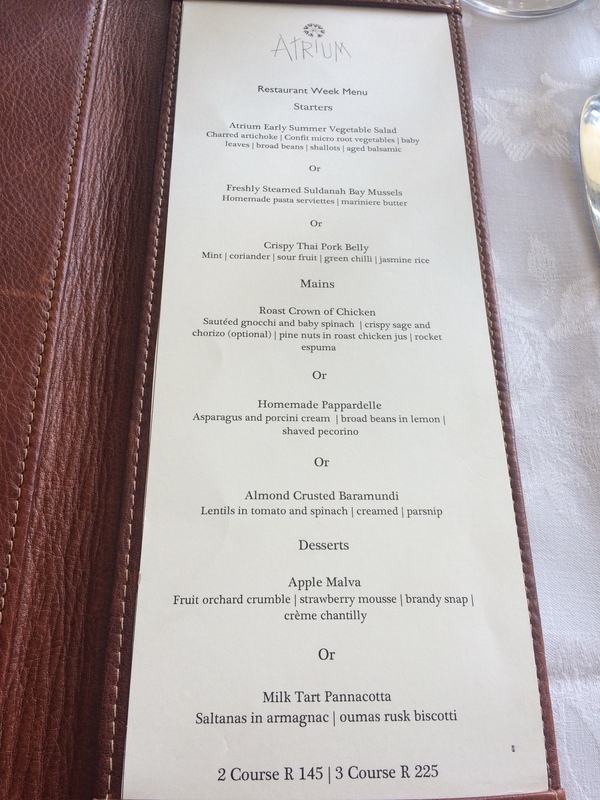 But that’s not all, a quartet of intriguing dishes were placed in front of us: tropical fruit salad, oats with vanilla and star anise, fig with goats cheese and a herb vinaigrette, and a coconut pannacotta with granadilla jelly. A flavourful start to the day. After this, our warm breakfast of salmon with scrambles eggs and hollandaise sauce was served. Another well-executed dish. It’s difficult to find fault with the Restaurant Mosaic or the The Orient. Every detail is thought of and as a guest, of the hotel or the restaurant, you are well taken care of. The service is impeccable. I was a great weekend away. And when the menu changes, I’d love to be back again. A goodbye gift from the restaurant. 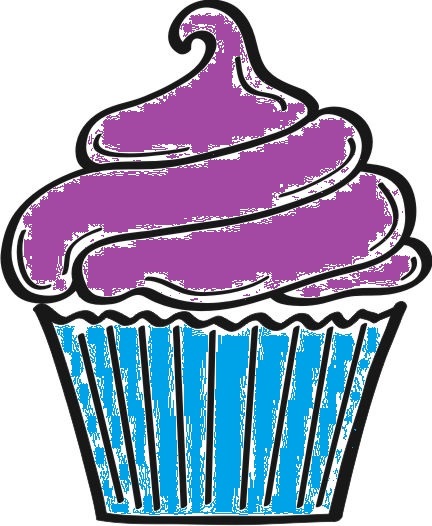 I give Restaurant Mosaic 5 cupcakes. I can forgive the unfortunate pairing with the Iona. Tacos tacos tacos… I could eat tacos all the time. It’s one of my favourite dishes. And because of that, it’s the reason I’ve named my blog after it: Tacovolution. With the love for tacos comes the love for Mexican food (or TexMex). The spiciness, crunchiness, freshness and use of simple ingredients means that most Mexican dishes are always scrumptious. 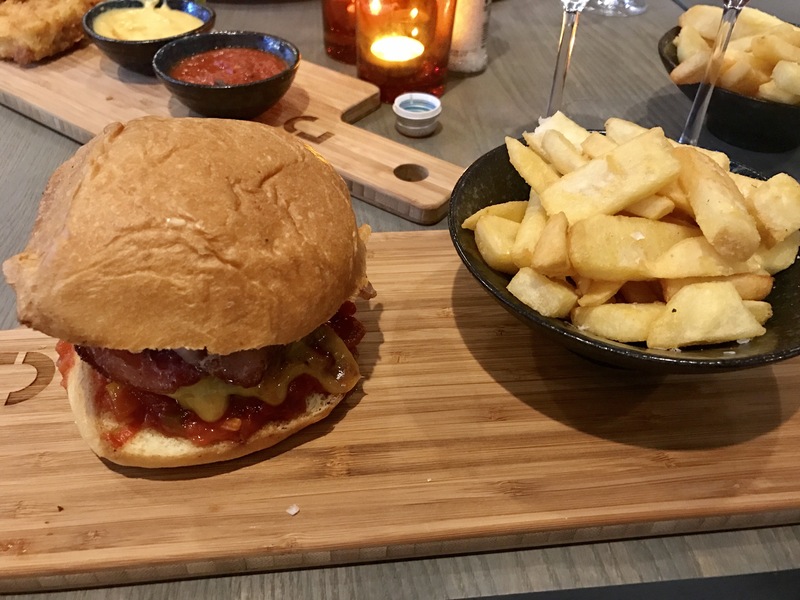 So cue in El Pistolero, located in Constantia Park in Pretoria. El Pistolero has been open for over a year and a half and while I’ve known about for a while, I’ve heard mixed reviews about the restaurant. So after an Eat Out labelled it as one of the restaurants to check out in Pretoria, I knew I needed to have a taste. El Pistolero is next to Woodstock Urban Pizzeria and I almost walked into it. El Pistolero is to the left of the pizza place and is yellow. It has some great seating options: inside, non-smoking outside and smoking outside. As soon as I entered the restaurant, a waiter welcomed me and let me choose where I wanted to sit and then brought the drink and food menu. After my friend arrived, which was 5 minutes after I was seated, the waiter came by ready to take our drink orders. We ordered margaritas (how can you not? ), a Marga-rona and Tepache. The Tequila Margarita was refreshing. It was made from tequila, grapefruit, lime, and sugar syrup. Our waiter assured us that the grapefruit and lime were fresh, and it was indeed. The rim of the drink was also salted well. It was a well-made margarita. The Marga-Rona is now one of my favourite drinks. It combines my two favourite Mexican beverages: margarita and Corona. A Corona is added to the margarita giving it a cider taste. If the tequila in margaritas becomes too much for you, then this drink is perfect (given that you can handle a light beer). We also tried the Tepache, which is a fermented pineapple drink. It’s quite refreshing and the fermentation is not overbearing. It’s the perfect drink if you like pineapple in your alcohol or alcohol in your pineapple. Already, no fault with the drinks, so I was salivating by the time the starters arrived. Unfortunately, El Pistolero had run out of Jalapeno Poppers. I was disappointed because I had been thinking about them for a week. Luckily, there are plenty of options. We ordered the Ceviche and Sweet Street Snack. The Sweet Street Snack was mango, green melon and cucumber. The fruit/veg is sprinkled with chili powder which makes an interesting combination: refreshing and spicy. For a starter, it’s perfect. It’s light, refreshing and tasty. And it’s a big portion. It would be way too big for one person and for 2 people, it’s still just a little too much. But I would order it again. Especially on a warm Pretoria day. The other starter was ceviche. Ceviche, if you’re not familiar with it, is a seafood dish in which fresh raw fish is cured in citrus juices (lime or lemon). El Pistolero’s ceviche is hake or yellowtail fish that is cured in lime and orange juices. It is accompanied by nachos, red peppers, and pickled Jalapeños. The ceviche is delicious. It’s fresh, crunchy (from the nachos and red peppers) and spicy. It’s a well-rounded dish. And even though we were almost full from the street snack, and trying to keep place for our mains, we made a point of finishing off the ceviche. Again, I’d happily order the ceviche. Jalapeño poppers for what? After the tasty starters, it was onto the mains. We ordered the Cordero Taco and Gringa Taco. Like I said, we came for the tacos. Both taco dishes are served with soft corn tortillas. The Cordero taco is slow-cooked leg of lamb in adobo (a marinade/sauce made from paprika, oregano, salt, garlic and vinegar). Accompanying the lamb is crema (a soured, thin cream), mint salsa, pumpkin seed salsa and potatoes. The taco was amazing. The lamb was tender, the salsas added flavour and spiciness and the potatoes added a softness and earthiness. I really enjoyed the taco. The second taco dish was the Gringa taco, which is marinated beef short-rib, guacamole and parmesan crisps. This was my favourite out of the 2 dishes, even though the beef was a bit tough. The dish was spicy, more spicier than the first taco dish, but it was crunchy and had more flavour. I enjoyed the crisps and could’ve eaten a plate of it. But if you’re not a favour of spiciness, I’d give this dish a miss. My mouth was on fire for a good few minutes 😛 . After that spicy experience, we ordered churros with dark chili chocolate and milk jam caramel. The churros were crunchy and sweet. I could’ve eaten them just as they were, with the milk jam caramel. But the chocolate did add more sweetness and spiciness. It was a well-rounded dessert. There was nothing I would’ve changed. 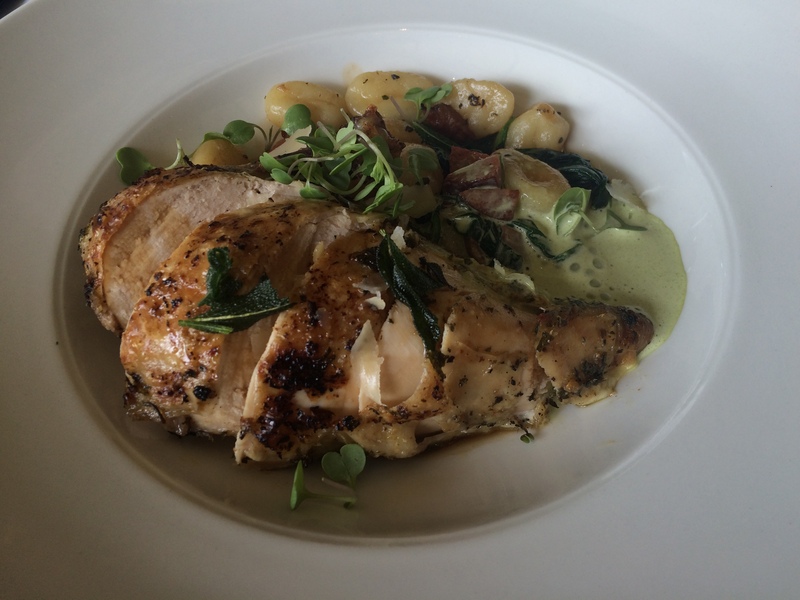 Overall, I had a great experience at El Pistolero. Every dish was tasty and filling. I would happily order any of the above dishes again. And the dishes are also well-priced. The service is also fantastic. The waiter was always available when we needed him and he cleared up the table without being asked to. And finished dishes or straw wrappers were removed quickly. In terms of ambiance, I could’ve spent a few more hours at El Pistolero. It has a great vibe. The restaurant is airy, the decor Mexican and the music transports you to Mexico or Texas. I would happily go back to El Pistolero and I’m disappointed that I didn’t go earlier. It’s an amazing restaurant. 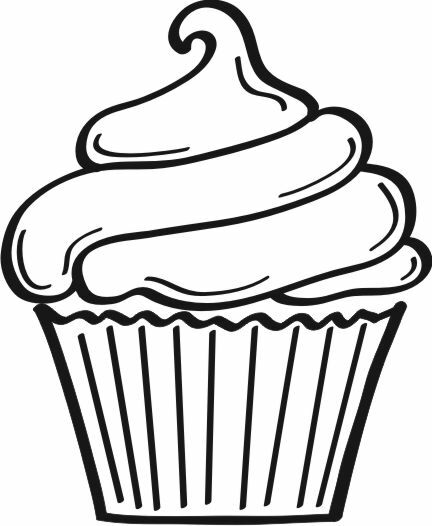 Therefore, I give El Pistolero 4 cupcakes. 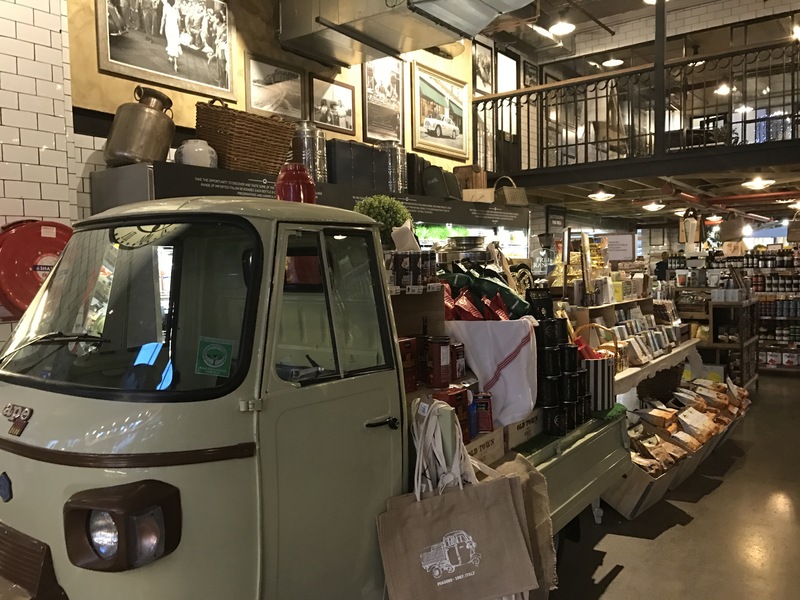 Cape to Cuba has been a restaurant I’ve wanted to visit since moving to Cape Town. The idea of sitting by the ocean, watching the waves and smoking a cigar definitely appealed to me. Unfortunately, I never found the time to venture to Kalk Bay. However, all I need was some motivation. That being relocating to Joburg. So I made it my mission to head to Cape to Cuba before I left the Mother City. Cape to Cuba is located next to the train line, with an amazing view of the ocean and the harbour. The restaurant has a Cuban vibe to it, with chandeliers, and references to Ernest Hemingway and Che Guevara. Both the restaurant and the bar have this inviting feel. We were met by a friendly waiter who let us wander from table to table until we found the right one. Guess it pays coming during a weekday and during lunch 😉 . He quickly took our drinks order: I had the Hibiscus Berry Cooler, which was very sweet due to the Monin Hibiscus extract and the lemonade. Still it was a refreshing drink. Janina had the Virgin Mojito, which is basically lemonade. First, we had the chili poppers which were spicy and sweet (thanks to the cream cheese). I love trying out chili poppers but I can never handle the heat. The barbecue sauce that accompanied the poppers helped by reducing the spiciness. We then moved onto the potato peels with cream cheese and sweet chili sauce that helped with the heat of the poppers. I really underestimated those poppers. The peels were crispy and delicious, plus the sweet chili sauce added a great flavour. Next was the three corn fritters which came with a sweet chili sauce. I must admit the size of the fritters amused me. They were much larger than I expected, which meant that the fritters were quite doughy. The pan fried chorizo and olives were next. The chorizo was cooked well but I expected the chorizo to be spicy. The only spiciness came from the sauce. The olives were tasty and soft and paired well with the chorizo. The Cuban bread that accompanied it was quite dense but soaked up the sauce nicely, making it a great spoon 😛 . Then we got our fingers messy with the sticky pork ribs. The ribs were delicious with a barbecue sauce and were tender. However, a finger bowl would’ve been appreciated to clean our fingers. 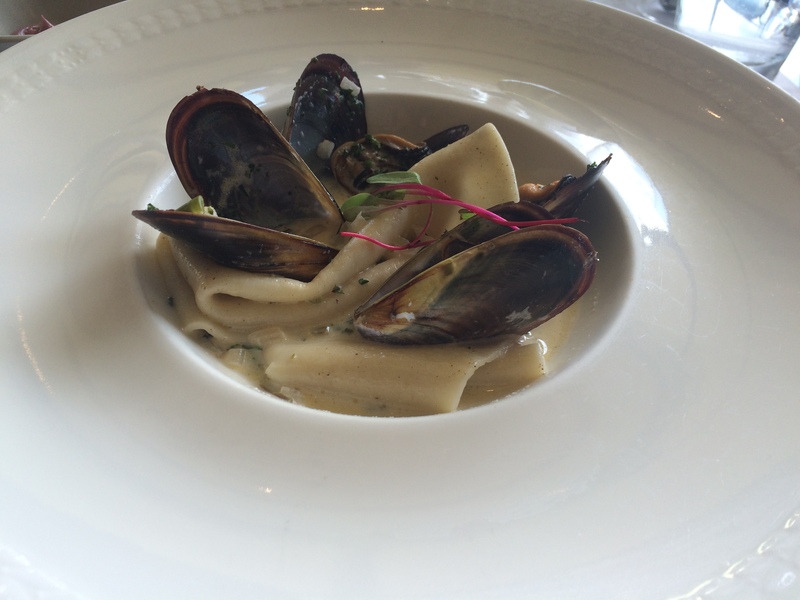 My favourite dish was the mussels, which I expected to be served in a thick, creamy sauce, but was pleasantly surprised with the creamy sauce it was served with. The sauce had wine, garlic and dill. Although it did taste like there was coconut milk as well. Also delicious was the grilled calamari tubes, with paprika, capers and red peppers. The calamari was cooked well and was spicy. The capers added to the saltiness of the dish. Lastly, we had the grilled sardines, which were very salty. The sardines were covered in coarse salt and Semolina. Honestly, I don’t enjoy sardines but Janina enjoyed them and even took them as takeaways. My experience at Cape to Cuba was fantastic! The food was delicious, the staff friendly and sitting close to the beach added to the Cuban feel. The best part of living in a coastal city is the wide array of fresh seafood that is available any where you go (well at least majority of places 😉 ). And there’s nothing better than fresh sushi. Sushi has been an ever-present meal in my life. However, it started off on a bad note. My first sushi experience involved 12 year old me attempting to recreate sushi I watched being made on a non-food show. Sounds promising already, doesn’t it? Rice cooked, salmon and wasabi lined up, and the maki was rolled. It rolled quite easily actually. Then I took a bit and my eyes immediately started watering. I had been over-zealous with the wasabi. Come to think of it, I have no idea why I added a layer of wasabi to the nori. Aside from the crazy spiciness of the wasabi the taste completely freaked me out. I couldn’t comprehend how people enjoyed eating this. It was raw fish! Thinking about it now, it’s funny how sushi is one of my favourite dishes to eat. I don’t think I could go without it. Clearly my first, second and third experiences didn’t deter me 😛 . Now, eating amazing sushi has become a weekly thing. To the point of where I daydream of inari. Which leads me to gush about my new favourite sushi place in Cape Town: Active Sushi. 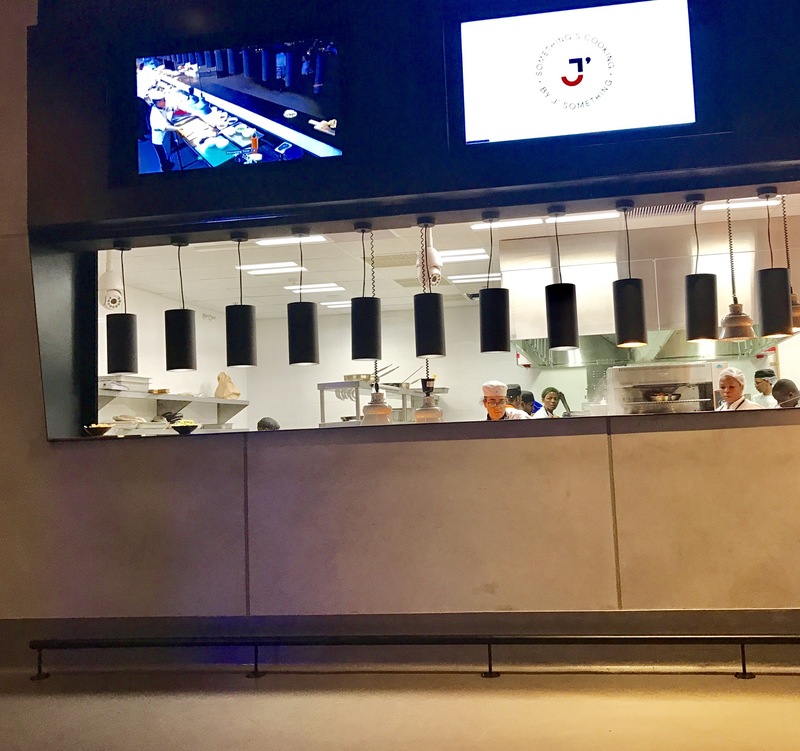 Active Sushi is has 2 restaurants: one at the Portside Building (below the FNB building) and one at the Mirage Building. Both venues offer an “all you can eat” sushi special that runs every day for R139, however, the Mirage does offer more varieties. I’ve been to Active Sushi a few times in the past few months and the quality of the food has always been great! I always have a few portions of the salmon sashimi, salmon roses, chili prawn inari, salmon inari, New York roll and Spicy Roll 1. The salmon is always fresh so the sashimi is always delicious. I must admit that I’ve had better salmon roses but the roses are tasty as well. My favourite is the inari – that’s what I salivate over every week. 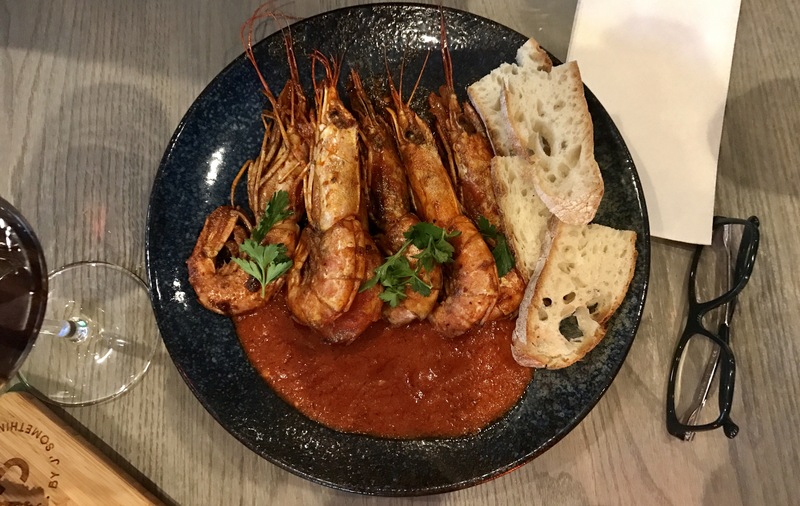 For the chili prawn, Active Sushi adds a chili sauce, which has 7 spices, to it that’s extremely spicy on it’s own but works fantastically with the prawns. Explaining the chili prawn inari just doesn’t do it justice. You’re just going to have to take my word for it and try it! 😉 . The salmon inari is just as yummy! Instead of a sauce, the 7 spices are sprinkled over the salmon. This, I must admit, leaves a burning sensation in your mouth, but I can’t handle spicy food. The california rolls are always intriguing to me. The New York Roll is smoked salmon, avo and cream cheese. Cream cheese? Who would put on that on sushi. But it’s delicious. The smoked salmon and cream cheese pair well as the cream cheese provides some sweetness. The Spicy Roll 1 is spicy salmon (using 7 spices), sesame oil, avo and spring onion. It’s basically the same as the salmon inari but wrapped in rice. It’s still tasty and spicy. I’m sure you’ve noticed that I haven’t had any tuna sushi. I’m not a fan a raw tuna. However, being adventurous I tried the seared tuna sashimi, which tasted odd to me. It was rubbery in the middle and cooked on the outside so it didn’t sit well with me. But my friends woofed the raw and seared tuna down. Active Sushi is my favourite sushi place in Cape Town and there’s many sushi places in Cape Town. I enjoy the great seafood quality and the vibe of the place. The staff are also very friendly and very patient. For the next 2 restaurants in Restaurant Week I flew up to Joburg. The first restaurant was the Atrium Restaurant, located in the Intercontinental Johannesburg Sandton Towers. 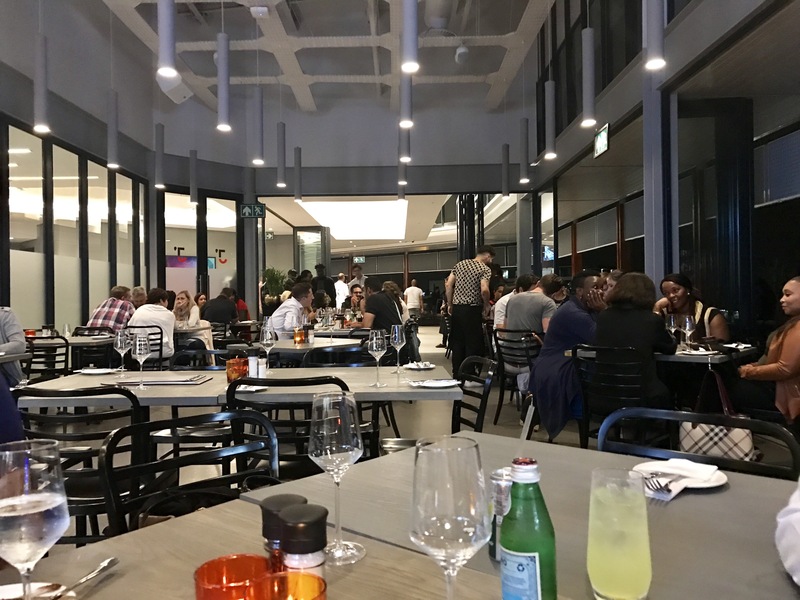 The restaurant has a pleasant ambiance – similar to many fine-dining restaurants in Sandton – and had a views of the street. On arrival, a friendly manager met us (Themba) and showed us to our table. A waiter appeared seconds later, ready to take our drink orders. However, we hadn’t even received the wine list! 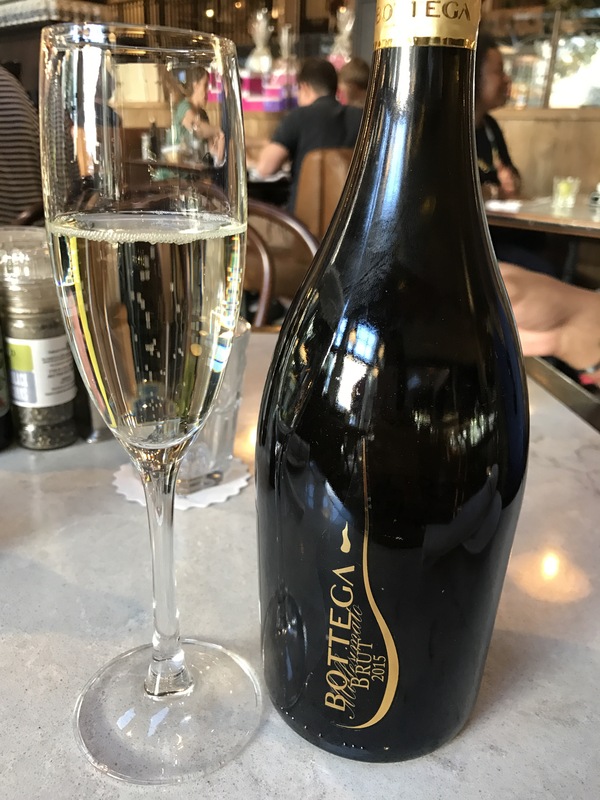 After receiving the wine list we were ready to order but the waiter couldn’t pronounce the wines and had to take the wine list with her. She arrived a few minutes later, empty handed, as she could not find the wine we requested. This was understandable as the wine list was extensive. My boyfriend (who as Janina also has a name – Lee) and I ordered 2 glasses of the Warwick First Lady unoaked Chardonnay, 2014 (it was going to be a long day so a bottle of wine would have been overambitious 😛 ). It was a lovely wine, smooth and with fruity notes. What impressed me about the wine was the wine bottle was brought to the table and poured in front of us. Not many restaurants do this when ordering wine by a glass and it’s a great service to have. For me, I’d like to be sure I’m drinking the correct wine and I’d also like to see the year. Wine in hand we were ready to order. Another friendly waiter arrived to take our orders but could not explain any of the dishes, as the menu was new. I don’t think that is a sufficient excuse, especially when you’re participating in Restaurant Week and the restaurant will be serving the same menu for a week. Nonetheless, after a quick explanation from the kitchen our orders were taken. For starters I ordered the Thai Pork Belly and Lee ordered the Freshly Steamed Saldanah Bay Mussells. However, 10 minutes later a staff member from the kitchen arrived to inform me that the pork belly was unavailable as it was still being prepared. I must admit I was disappointed, after reading the menu I was excited about the pork belly. With great regret I ordered the same starter as Lee – regret as I live in Cape Town so I doubt the mussels will be as fresh as Cape Town. The starter was alright, nothing amazing. The mussels were cooked well and the mariniere sauce was creamy and had a strong lemon taste. The pasta serviettes (large sheets of pasta) were al dente and added some meatiness to the dish. 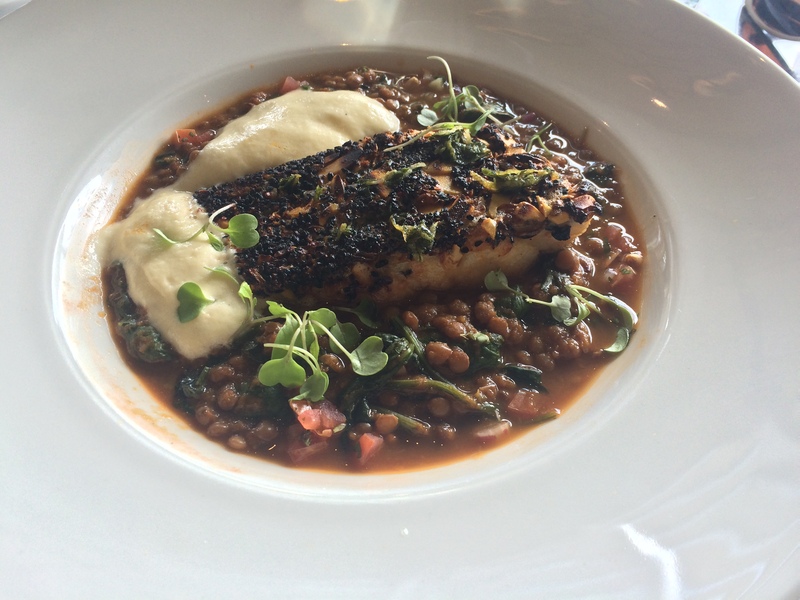 For the mains, I had the Almond Crusted Baramundi, which is a fish (Sea bass) dish. The Sea bass was cooked well and was very tender. The almond crusting provided no depth to the fish. Surrounding the fish was a lentil, tomato and spinach sauce which added heaviness to the dish and an earthy taste to the fish but was quite bland. However, the creamed parsnip was delicious and made the dish enjoyable. However, every bite without the parsnip had to be forced down. Lee had the Roast Crown of Chicken, which was a huge portion. The chicken was cooked well and was tender. The gnocchi was al dente and delicious. And then for some odd reason, chorizo was added to the dish which added saltiness to the dish. Each element on it’s own was cooked well and enjoyable, however when you combined the elements it was a complete miss. No element paired well with the other. After the mains, and after ONLY Lee’s plate had been cleared, we waited for service and for dessert. And then we waited and waited some more. Some how all the waiters had disappeared! There was no one around – no one checking on you, no one clearing away my plate, no one bringing dessert – just an empty restaurant, which mind you had 2 other occupied tables. Never have I been to any restaurant or dive where the staff just disappeared. 20 minutes of waiting later, I went to the front desk to find out what’s happening. After a staff member went into the kitchen, dessert magically appeared after a minute, brought out by a waiter. After receiving an apology, but no explanation, we tucked into our dessert. I had the Apple Malva, which was delicious and the best dish I had at the Atrium. The malva was moist and lovely on it’s own. The strawberries added sweetness. 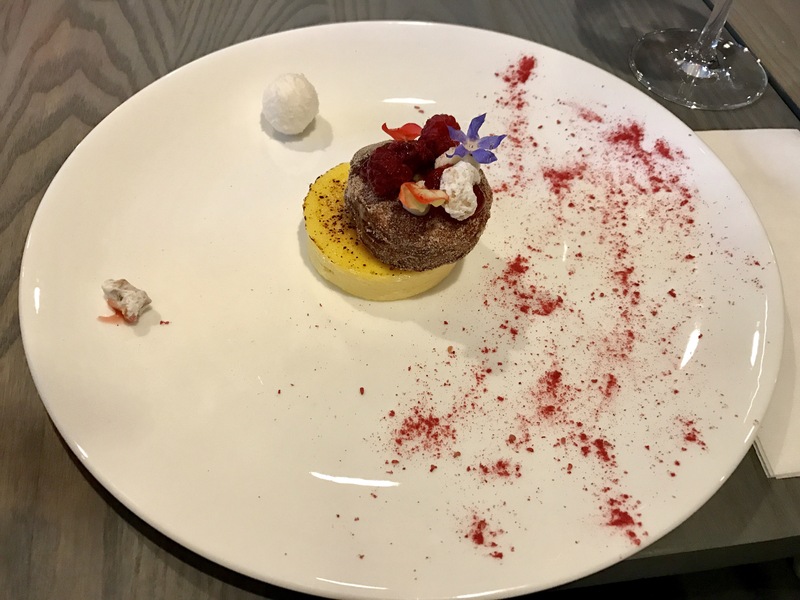 It really was a well-executed dish and made me realise the potential that the Atrium had – they really could produce fine-dining dishes and not the average nonsense we ate. Lee ordered the Milk Tart Pannacotta, which was average. The pannacotta was firm and had a subtle taste similar to a milk tart. The Ouma Rusk biscotti added some crunch to the dish. For a fine-dining restaurant I was very disappointed in the Atrium Restaurant. Service was terrible and left a lot to be desired. The food was also average, aside from the Apple Malva. I would definitely not go back. 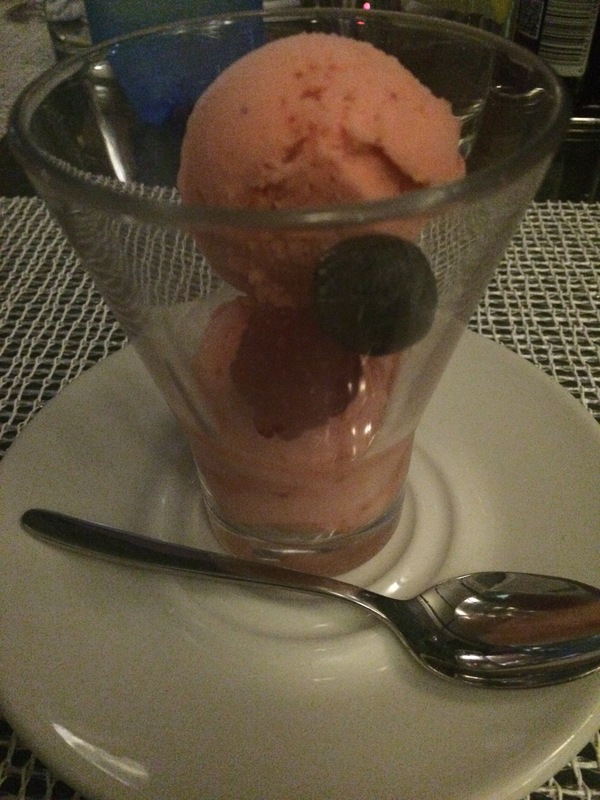 I wrote a short review on the Restaurant Week website for the Atrium Restaurant, detailing the above terrible experience. Themba contacted me and apologised for the service received and tried to explain that the Atrium is not run is this poor manner. While I appreciate being contacted it doesn’t change my mind about the Atrium. Restaurant Week is a great opportunity for restaurants to showcase themselves and the Atrium restaurant definitely dropped the ball. 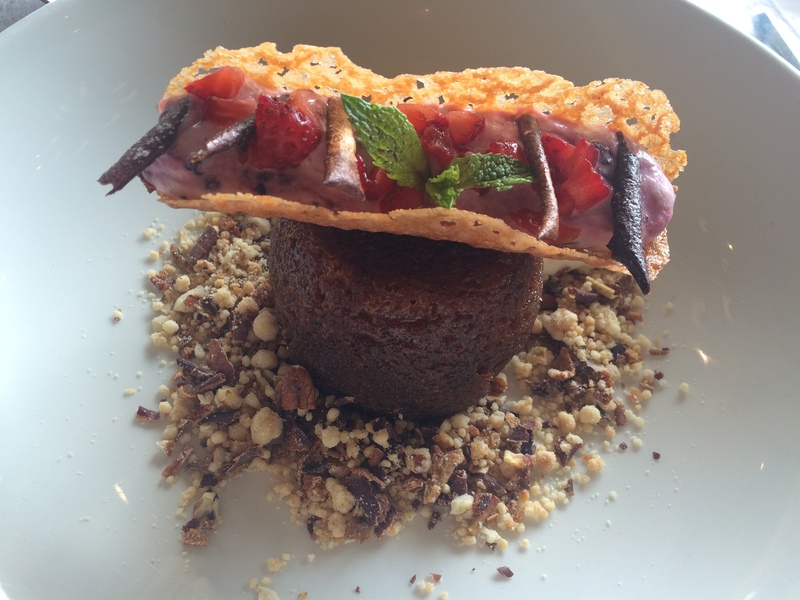 Restaurant Week kicked off on the 22 October 2015 and boy was I excited! A whole week dedicated to eating scrumptious food. I was so excited I made the booking’s a month in advance, before it was even publicly available . I think I have a problem, haha. 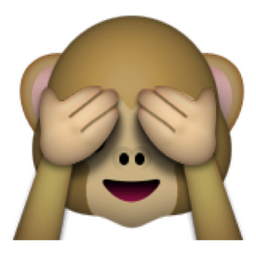 So this blog and the next 2 are dedicated to my first South African Restaurant Week. I kicked off the festivities with visiting Tobago’s Restaurant, situated at the Radisson Blu with a spectacular view of the ocean. It really is an amazing place to watch the sunset and, luckily in my case, watch the full moon rise. On arrival, a friendly host met us at the front and showed us to our table. Already off to a great start! After having celebratory sundowners, we were ready to start with the tasting menu. 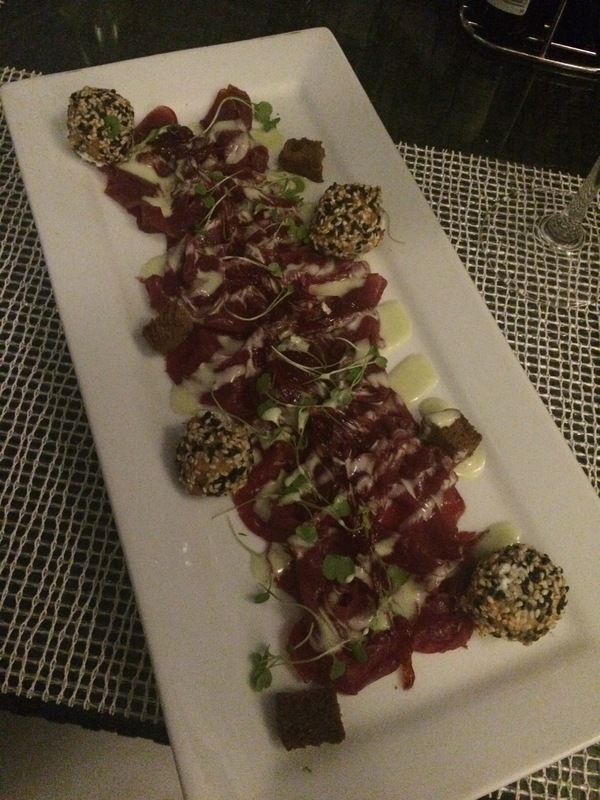 Although it took a little bit of time, our Springbok carpaccio arrived. It was a huge portion making me wish I had skipped lunch. The starter was accompanied by an onion marmalade, garlic rye and a goat’s cheese sesame seed ball. It was divine! On its own the springbok carpaccio was fresh. The onion marmalade added great depth to the dish and had a bit of sting (it tasted like there was bit of horse radish as well). The warm goat’s cheese provided a rich creaminess to the carpaccio and the rye added crunchiness making it an amazing dish. So many simple ingredients to create a delectable starter. I was impressed and ready for the main dish. Again we waited a bit for the main dish and were thrilled when it arrived. We ordered the grilled rib-eye steak, medium rare. However, upon arrival I noticed that the Béarnaise sauce had started to congeal and upon touching the steak I was disappointed to find the meat cold. The disappointment grew as we realised that they had overcooked our meat. We promptly sent back our food and had the host, the manager and the waiter apologize to us for the quality of the food. On top of the apologies, to help with the wait, we were brought sorbet to enjoy. I must admit I’ve been to a number of well-established and reputable restaurants and I’ve never experienced this level of amazing service when something goes wrong. My friend and I were thoroughly impressed and we appreciated Tobago’s handling of the situation. Not too long after, round 2 of our mains arrived. We cautiously cut in to see if they had the order correct and they did. We dived straight in! The steak was a bit tough and fatty, which was disappointing given all the drama. 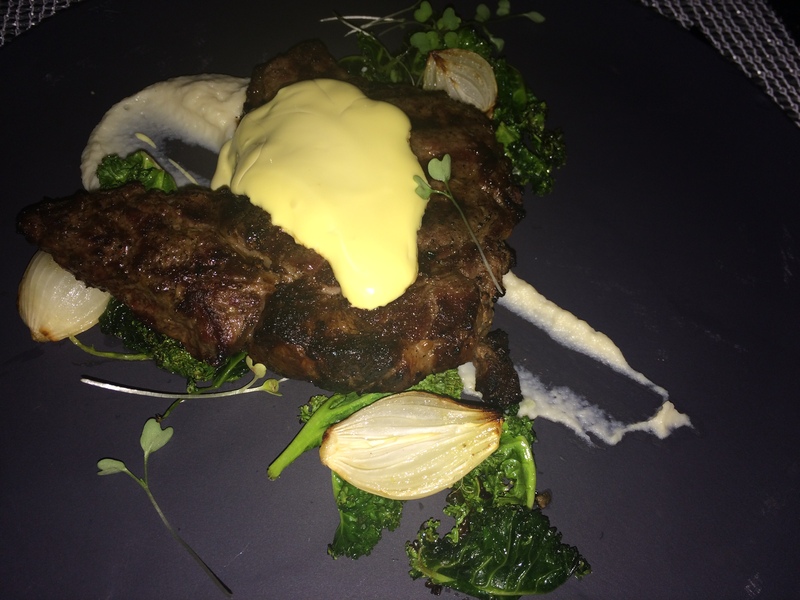 However, the Béarnaise sause was rich and buttery, the cauliflower puree with truffle oil was delicious, with the truffle oil adding earthiness, and the caramalised onions were cooked well, not too soft. But my favourite was the wilted kale, which was crunchy and unexpected. All the accompaniments paired well with the meat, well the portions I could eat. I’m still giggling to myself remembering how my friend kept commenting about how long I was taking to chew a small piece of the steak 😛 . With the mains done, although most of my steak still on the plate, we waited for dessert. I had the pineapple and mint panna cotta with star aniseed meringue, mint gel and pineapple crisp. The panna cotta was perfect for the warm night and the pineapple and mint infusion added sweetness and freshness. The meringue was a bit dull for me. If there was any infusion in the meringue it was very subtle. The mint gel added to the freshness but the pineapple crisp was too sweet – it had a candied taste and was unappetizing. 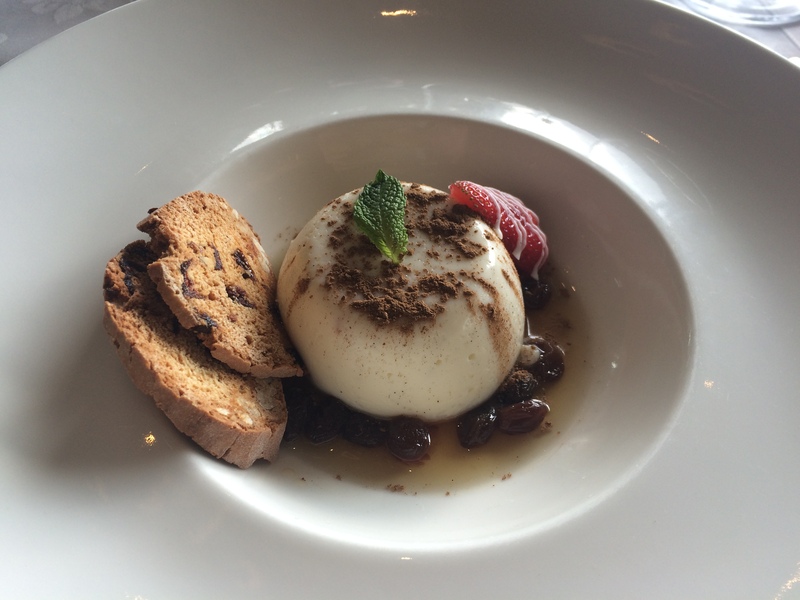 I enjoyed the panna cotta on its own but I doubt I’d order it again. 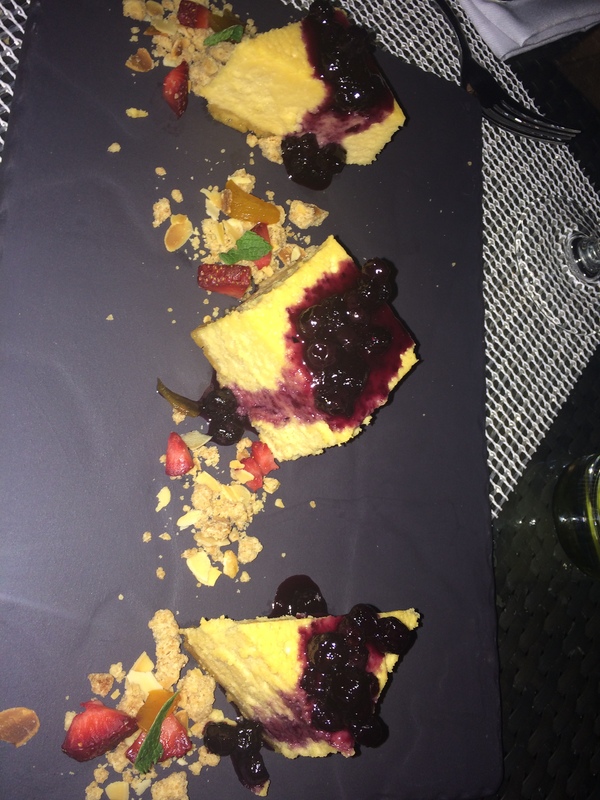 My friend, who has a name – it’s Janina 😛 , had the Rooibos cheese cake. The cheese cake was delicious and the rooibos was infused well. The blueberry compote, strawberries and mint provided some sweetness, however, the cheese cake was very heavy. Janina only managed to finish 1 of the 3 pieces and after eating the panna cotta, I was no help. Even though the main course was a disappointment our night was not ruined. The other courses were enjoyable and I would definitely go back to Tobago’s for their sundowners. The level of service is impeccable and the ambiance fantastic.